Bitcoin had a blistering first half of 2017. It rallied from about $US1,000 a coin to a record high of near $US3,000 before finishing June near $US2,500. It booked a first half gain of about 168%. But Goldman Sachs thinks bitcoin still has more room to run. In a note to clients sent out on Sunday, Sheba Jafari, head of technical strategy at Goldman Sachs, suggested that while bitcoin’s correction hasn’t run its course, it’s ultimately heading higher. However, bitcoin enthusuasts shouldn’t worry too much. 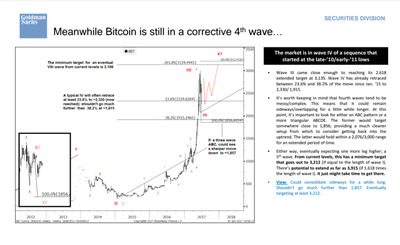 From there, Jafari sees the fifth wave of the move taking the cryptocurrency to a new record high.